David Urbansky was awarded the Congressional Medal of Honor for gallantry in battle at Shiloh and Vicksburg during the Civil War. He was the only known Jew and one of only 18 of Ohio’s 310,364 Union soldiers in the Civil War to be so honored. He was one of six Union Jewish soldiers nationally to receive this award. His Medal of Honor is housed at The American Jewish Archives. Urbansky was born in Prussia in 1843 and came to America with his family when he was 15, settling in Columbus, Ohio. Six months after the Civil War broke out, he enlisted. He served under General Grant and Sherman, eventually attaining the rank of Corporal. During the Vicksburg campaign, one of the battles ended with Urbansky’s commanding officer seriously wounded lying out in “no – man’s land” between the opposing forces. Urbansky rushed onto the battlefield to pick up his commander and, despite fierce enemy fire, he made it back to the Union line. This act of bravery saved the officer’s life and contributed to Urbansky becoming a recipient of the Medal of Honor. Urbansky fought in the war without being an American citizen. Upon his discharge at the end of the war, he quickly obtained his citizenship papers and soon thereafter married Rachel Henry. They moved to Piqua where they had 12 children and Urbansky prospered selling clothes. After a long illness, Urbansky passed away in 1897. The funeral was held at his house in Piqua with Rabbi Phillipson of Rockdale Temple officiating. The burial followed at Piqua’s Cedar Hill Jewish cemetery. After his death, his family moved to Cincinnati. 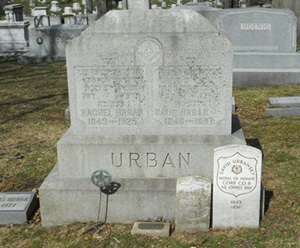 When his widow, Rachel, died in 1914, she was interred in our Walnut Hills cemetery and the family had Urbansky’s remains moved to Cincinnati and placed next to her. 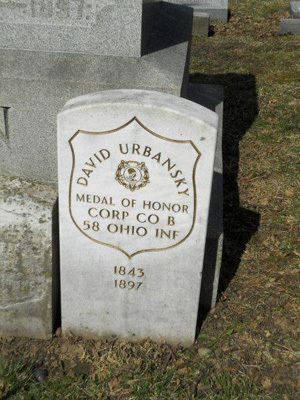 In 2000 Raymond Albert of Amanda, Ohio, who was a member of the Medal of Honor Historical Society and whose hobby was tracking down the final resting place of Medal of Honor recipients, made his 16th discovery when he discovered David Urbansky’s grave. 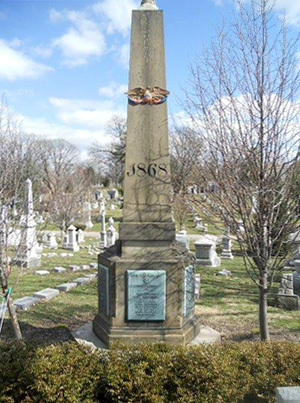 A service on December 10, 2000 in our Walnut Hills cemetery marked the dedication of a new stone (pictured above and to the left) provided by the US government to mark Urbansky’s grave as that of a Civil War Medal of Honor recipient. A squad from the 6th Ohio Volunteer Infantry Reenactment Group fired a 21 gun salute with period rifles and a bugler played taps at the conclusion of the service. Several people at the service also had been looking for Urbansky’s grave but had been hampered by name variations. Urbansky had served in the army and become a citizen under the name “Orbansky.” He married as Urbansky which continued to be his name until his death in 1897. The family later changed their name to Urban, which is the name on his family’s headstone at Walnut Hills.